Contest Links: Create a Contest! Learning how to Create a Contest on HowTheMarketWorks.com is simple! Start by logging in or creating an account. Once you are on the contest page, just give your contest a name, describe it, and set a few basic trading rules! If you aren’t sure what rules to use, we pre-populate all rules with the most popular settings! Give your contest a name! This will be handy for other people to find the contest you created. We want to know who uses HTMW! The group type lets us know where our stock game is most popular, which we keep in mind when we develop new features. This is useful for someone searching for your contest, they can look using the contest name and know its the right one by the description. It is usually recommended to use the same currency you are in to make it more realistic. Don’t worry about having to exchange money, we apply the exchange rate every time a trade is made. Initial cash can be set between $10,000 and $500,000. Registration Dates: This is when your users are allowed to join the contest and can be changed at anytime. It does not affect the trading dates. We recommend opening the registration a bit earlier than the actual trading period so people can practice before the contest starts. Trading Dates: This when trading starts and ends. By hovering over the little question marks “?”, text will appear. They can be very useful for finding quick information about the field you are trying to fill out. Public contests can be joined by anyone. Private contests will prompt you to create a password in order for people to join. Note: If you are the contest creator you can see everyone’s trades regardless of whether it is private or public. The minimum price is the lowest price you can buy or short (if enabled). If you set your limit at $1.00 it means you cannot buy stocks with a cost of less than $1.00. We recommend that beginners have a limit of $1.00 instead of $0.25, since trading in penny stocks for a contest leaves too much up to blind luck. This allows players to take a loan if they spend all of their cash equal to the amount of initial cash they had. Users will be charged 8% interest on the loan. You do not have to take out the loan, simply spend all your cash and you will start using your loan margin automatically. You can also change the interest amount by contacting support. This will allow you to short sell allowing users to profit if the stock price goes down. Unlike in real life, there are no margin requirements. Allows users to buy and sell a given stock in the same day. If not allowed, users must wait until the next trading day to sell a stock they bought the same day. Note: this is only true for one stock, you can still buy and sell multiple different stocks in one day as long as it was not already traded that day. US Mutual Funds: Allows Mutual fund trading. Note: these only trade once a day after the market close. US OTCBB: Over the Counter Stocks. A large majority are penny stocks. Users will be charged the chosen $ amount every time a trade is made, regardless of whether it is a buy,sell, short or cover. Note:An order is not the same as a trade, if an order is made, but is cancelled or expires before it goes through, the commission is not charged. The maximum amount of one stock(or mutual fund) you can own as a percentage of the total portfolio value. Example:With 25,000$ initial cash and 25% position limit, you can only trade $6,250 in one stock. Meaning you can’t buy more than 6,250$ of AAPL even if you had the money for it. 100% limits are Recommended for beginners. Note: If your portfolio value decreases making the limit lower than what you own in a given stock you will not be forced out of your position. 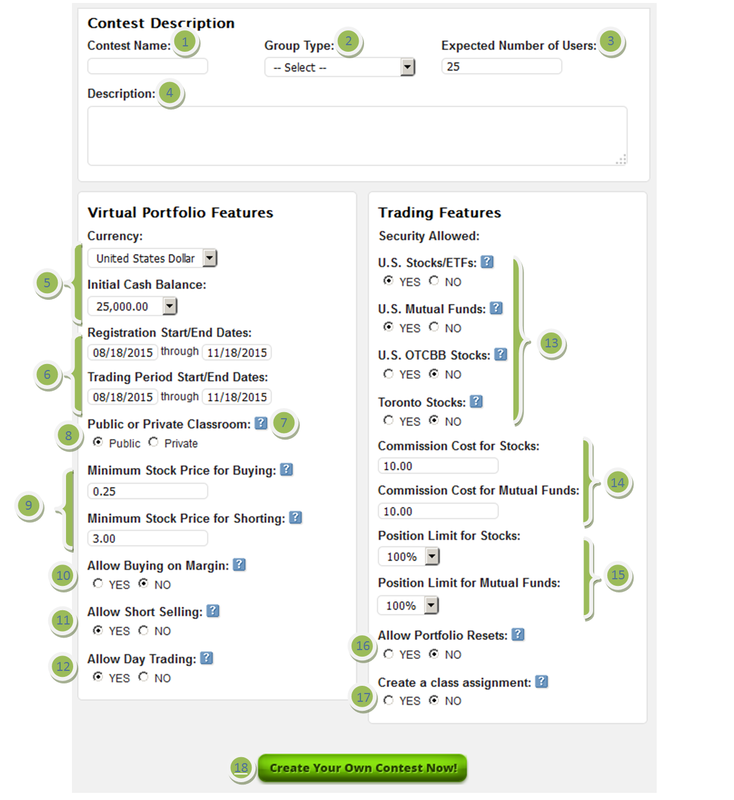 This allows users in your contest to reset their portfolios to the initial cash. All trades are wiped out, and they start back from the beginning. Click the Green Button once you’ve filled everything out and you’ve created your contest. Don’t worry, you can change everything by hitting the edit button after you’ve created it. And thats it! You will get a confirmation page where you will find a link to give anyone to register directly in to your custom contests, or they can find it using the “Join Contest” page! Click here to create a contest now!